Nerdy Birdy likes reading, video games, and reading about video games, which immediately disqualifies him for membership in the cool crowd—Eagle, Robin, and Cardinal. Nerdy Birdy is lonely. But at his lowest point, Nerdy Birdy meets a flock just like him and discovers that there are far more nerdy birdies friends than cool birdies in the sky. But what happens when a new bird flies in and she's not exactly cool or nerdy? As a self-proclaimed (and other-people-proclaimed) nerd, this book was AWESOME. Who needs the cool birdies when you can have a group of compadres that look like this? I mean, honestly. It's very obvious that the illustrator had a lot of fun with this book. One of the birds is even holding a lightsaber, for cryin' out loud. That's legit. Really though, Davies' relaxed, sketchbook style of illustrating really fits the fun nature of the book. I enjoyed them. And the story? 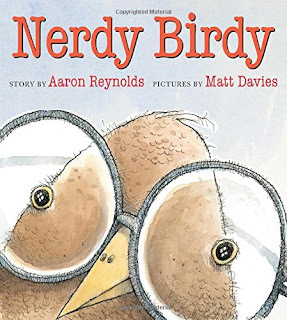 Well, it could've just stopped with Nerdy Birdy realizing that he doesn't have to try to be something he's not—that he can find friends just the way he is. But Reynolds carried it a step further (which does make it a bit of a long book) and brought in another character—a vulture—that's just plain weird. 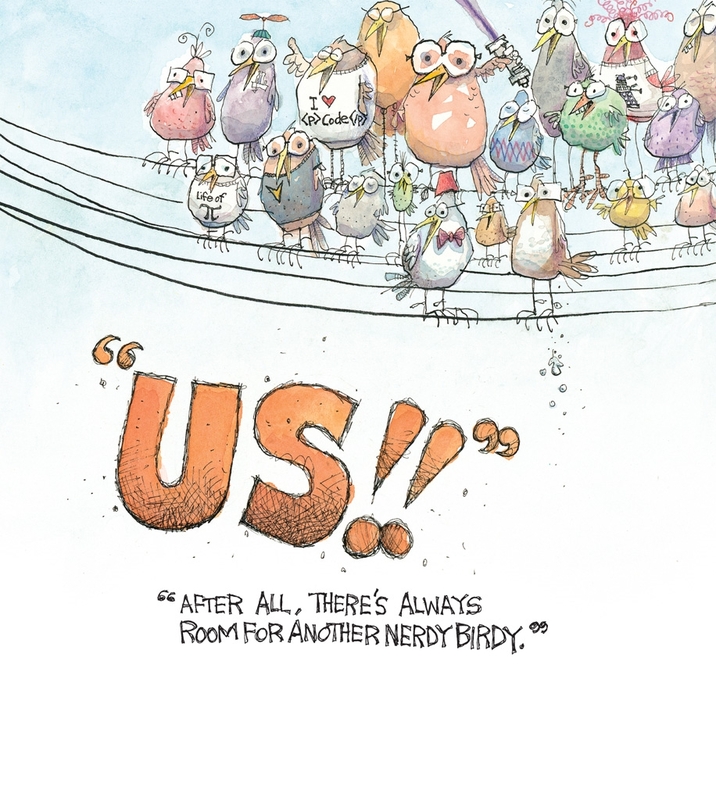 And still, Nerdy Birdy reaches out to be her friend. It's funny, cute, and still carries an awesome message of being a good friend. The not-quite-five-star rating is me wondering whether younger kids will fully appreciate the nerdy vs. cool factor. Or whether parents want to introduce that dynamic. I put the target age at a little older, to hit the school-age kids. I think they'd appreciate it more and laugh like I did.